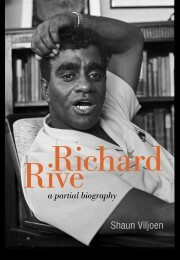 Richard Rive was born on 1 March 1931 in Cape Town, and grew up in District Six, which was a Coloured, or “mixed race”, area under apartheid. With the aid of a scholarship, Rive attended high school in Cape Town and studied at the University of Cape Town (UCT), where he graduated in 1949. Rive then trained as a teacher, and taught at Hewat Training College and at a high school in Cape Town. In 1962, he travelled extensively throughout Africa and Europe, while teaching and lecturing.